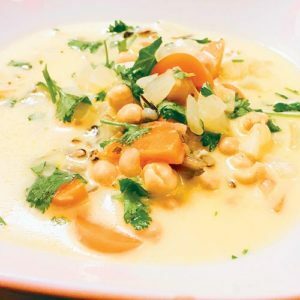 This recipe is somehow avgolemono meets spanish saffron vibes, together with a moroccan chickpea touch. Yum. It also made it into Food52’s Genius Recipes book, so that says something doesn’t it. It’s easy, it’s comforting, it’s healthy, it’s fast, and you get that creamy feeling without the heavy cream- it’s just thickened with yogurt and egg yolks. In a medium-large pot over medium-high heat, combine the olive oil, onion, and a couple of big pinches of salt. Cook until the onions soften up a bit, a few minutes. Add the carrots and cook for a few more minutes. 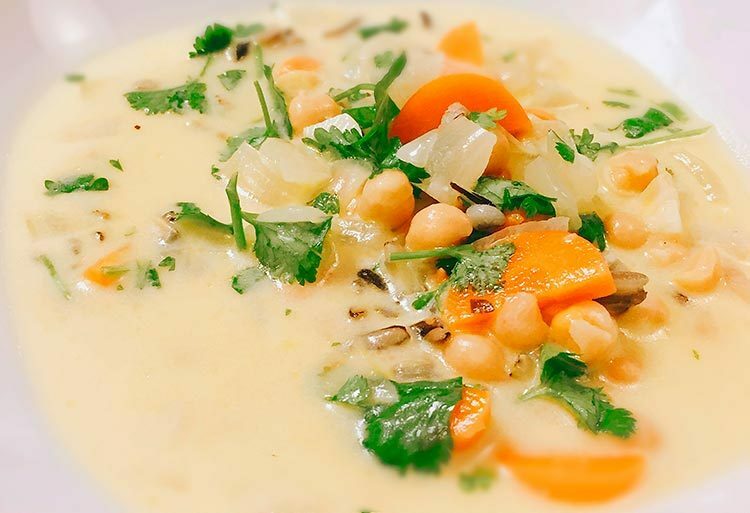 Stir in the chickpeas, and then add the vegetable broth and garlic. Bring to a simmer and cook until the carrots are tender. Remove from heat. Add in the cup of cooked wild rice. In a medium bowl, whisk the saffron and egg yolks, then whisk in the yogurt. Slowly add a big ladleful of the hot broth to the yogurt mixture, stirring constantly. Very slowly whisk this mixture back into the pot of soup. Return the pot to medium heat and cook, stirring continuously for another 5 minutes or so, until the broth thickens to the consistency of heavy cream, never quite allowing broth to simmer. Serve topped with a sprinkle of paprika and a handful of fresh chopped coriander/cilantro.